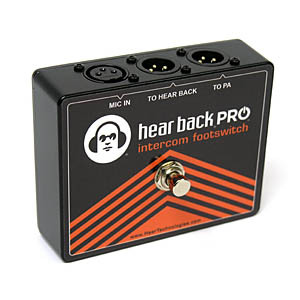 The PRO Intercom Footswitch allows one microphone to double as both a vocal mic and an intercom mic for the Hear Back PRO Mixer. Our Footswitch allows for hands-free switching between a vocal mic over the PA and intercom communication within a Hear Back PRO system, all over the same microphone. The footswitch can also be used in any application where a momentary A/B XLR switch is needed.